An "official bootleg" of the recent Andres Roots & Raul Terep duo gigs will be released as a free download on April 6th and will remain available through May 8th. Provisionally titled "Trad.alt.blues", the live album will contain audience recordings made by Antti Alanko on Feb. 20th at Rokibaar Underground in Tartu and on Feb. 21st at the Blue Icicle Festival in Pärnu, including new material, traditional themes, and several Bullfrog Brown and Roundabout numbers. "We weren't meant to do those gigs as a duo and we were certainly not planning to make a record, but since the shows were good, Antti taped them, and I'd been thinking about putting out a lo-fi "field recording" type of release for quite some time, this seemed like the perfect opportunity," says Roots. "The title was suggested by Steve Lury and I think it fits the album well: what trad.blues and alt.blues fans share is the belief that everything should be done live and preferably in one take, and that's what this is - it's not even a multitrack recording, so the take is the take and the mix is the mix!" On March 15th, Roots & Terep played a duo show at Solaris in Tallinn at the Haldjapere fashion show, then joined bassist Peeter Piik for Roundabout's appearance at Pubi Juudas in Tõrva. 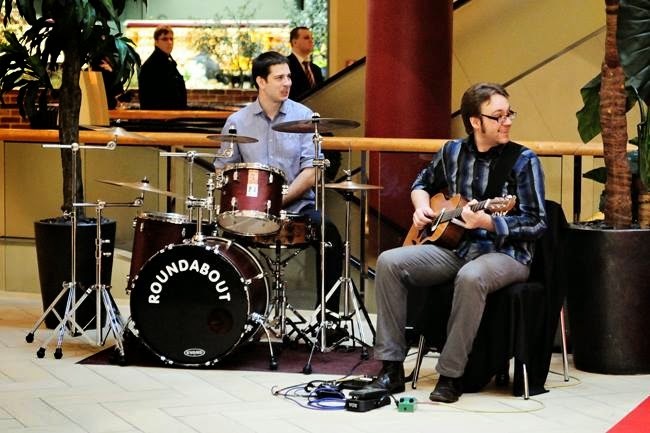 Roundabout will be back for the Linna Pea Rock festival in Rapla on April 12th; the event's proceeds will go towards the construction of a local recording studio.